Delivery service Flowers.ua provides free delivery fee of flowers to Chernovtsy. Order flowers with delivery to Chernovtsy through our site and bring your loved, colleagues or partners unforgettable impression! For making order for flowers to Chernovtsy you can use our catalog, or contact us by phone or . Send flowers to Chernovtsy can be completed with a beautiful soft toy or a box of chocolates. Flowers in Chernovtsy also can be accompanied by a free postcard. Making order for flowers in Chernovtsy will take several minutes. Buy flowers in Chernovtsy on our site quickly and easily. Florists of flowers internet-shop Flowers.ua able to collect floral arrangement at your request (you want some extraordinary bouquet of flowers, which is not in our catalog). Our courier service will ensure delivery the bouquet in Chernovtsy on time. Flowers delivery to Chernovtsy takes place 24 hours a day. Would you like to congratulate members of your family or friends who are in Chernovtsy? Online flower shop Flowers.ua and its team of professionals always ready to deliver flowers in Chernovtsy in the shortest possible time. 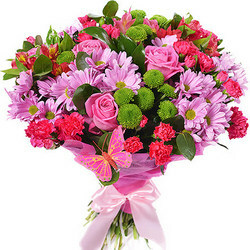 The section Flowers delivery in Chernovtsy presents different kinds of flowers and many other gifts. All you need to do to order flowers to Chernovtsy is choose a bouquet on website Flowers.ua and pay for order. Our florists take care of the beauty and freshness of every flower bouquets. Our professional couriers deliver flowers in Chernovtsy right to the recipient’s door. Ordering flowers in Chernovtsy on Flowers.ua take you a minimum time. If you have any questions, our experienced consultants will answer all your questions regarding the delivery of flowers. Turning to online flower shop Flowers.ua you’ll receive a high level Chernovtsy flower delivery service, excellent quality of flowers and prompt flowers delivery in Chernovtsy. Be sure that the flower bouquets in Chernovtsy are made with love in full conformity with the description on our website. There is no doubt in exceptional quality and freshness of our flowers. Online flower shop Flowers.ua guarantees proper flowers delivery in Chernovtsy at the specified time, without any delays. Ordering flowers in Chernovtsy is an excellent chance to surprise and congratulate your friends and loved ones in this city. Bouquet of fresh flowers is the best gift that brings a good mood and festive atmosphere. The page Flowers delivery in Chernovtsy presented flower bouquets in Chernovtsy of different styles and designs: vertical bouquets, round bouquets, romantic and traditional bouquets for every taste and in various price categories. Online flower shop Flowers.ua offers favorable price and extremely high quality of flowers and other products for over seven years of successful work.